Faeries are among the oldest beings known to Hylians and for as long as anyone can remember, they have always helped those in need. You will find that Faeries and Fairy Springs are abundant in the Land of Hyrule. It's very important to know all of the locations where Faeries appear. Small Fairies float around the land of Hyrule and usually occupy springs in groups. They restore up to a maximum of seven lost hearts, and can be captured by a net, and stored in a bottle for future use. If you die in the middle of battle, and you have a fairy in a bottle, the fairy will release itself and bring you back to life before flying away. 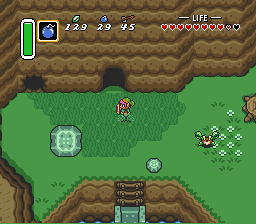 Larger human-sized Faeries occupy fixed locations in certain springs throughout Hyrule. They will completely restore your health, but you must come to visit them at their Faerie Spring in order to receive this benefit. Faeries are devoted to local Faerie Queens who will also aid you in your quest. Location: South West of the Eastern Palace. Description: There is a cave just to the east of the gateway to the eastern region. Enter the cave to find a Faerie Spring. 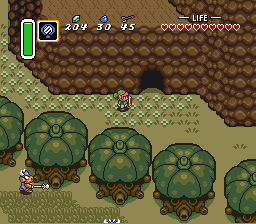 Description: There is a cave entrance near the fenced in Warp Location south of the palace. 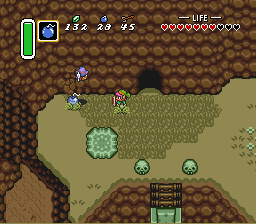 Enter the cave and follow the corridor to find four Small Fairies in a shallow pond. 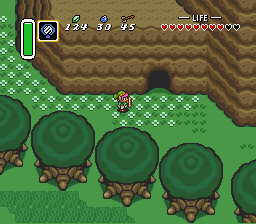 Location: South East of Link's House. 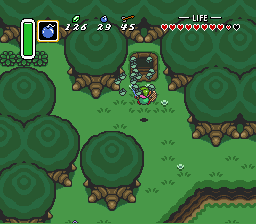 Description: There is a boulder in the north east corner of The Great Swamp covering the entrance to a Faerie Spring. Bomb the rock to gain entrance. Location: North West of Link's House. Description: There is a pile of rocks among a group of oak trees that you can dash into. 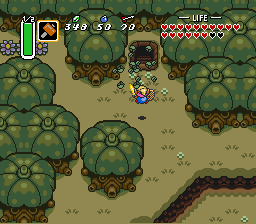 The rock pile covers the entrance to a cave where four Small Fairies reside. Location: East of the Desert Palace. Description: Enter the cave entrance to the west of the silent man sitting by a sign. It's wise to visit this Faerie before tackling the mysteries of the Desert Palace. Description: Place a Bomb near the darkened wall to the right of the Faerie statue and to uncover a small room holding four Small Fairies. Location: North East of Lake Hylia. 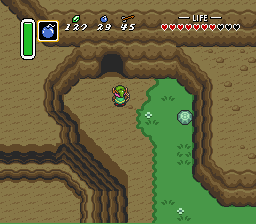 Description: Enter the frozen cave to the far northeast of Lake Hylia to find a spring with two Small Fairies floating about. This is also the home of a magical Good Bee. Location: North East of Hyrule Castle. Description: There is a single bush growing within a small patch of grass in this area. Cut the bush and drop down the hole to find a Faerie Spring. 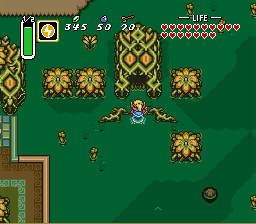 Description: After facing off with Agahnim, dash into the Strange Tree and drop down the hollow stump to find four Small Fairies hovering about a small sunken pond in the cave. Location: South West of the Dark Palace. Description: This Faerie location is in exactly the same place as it is in the Light World. It is east of the gateway to the eastern region. Location: North West of the Bomb Shop. Description: This Dark World Faerie location is also in the same place as its Light World counterpart. 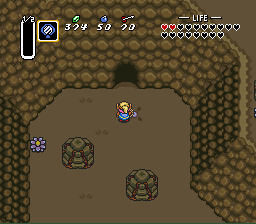 Dash into the pile of rocks to uncover the entrance to a cave containing a Faerie Spring. Location: Northeast of Ice Lake. 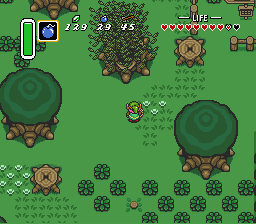 Description: In the same location where Link found the Ice Rod in the Light World, you will find a Faerie Spring in the Dark World. Remember to check all item locations in both Worlds. Location: East Misery Maze entrance. Description: There are three "mouth" entrances to the Misery Maze. The east entrance is the door to a Faerie Spring. Visit here and fill up your Heart supply before entering the main entrance to Misery Maze. Description: In a region full of powerful enemies and falling boulders, this is one Faerie Spring location that you can't afford to be unaware of. 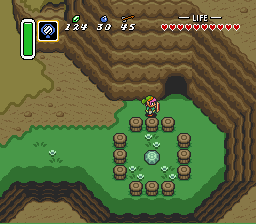 Visit the Spring whenever life on Death Mountain gets too harsh. Type: Faerie & Small Fairies. Location: North portion of Eastern Death Mountain. Description: There is a location at the top of the east portion of Death Mountain where you can find both a large Faerie, and a group of Small Fairies. 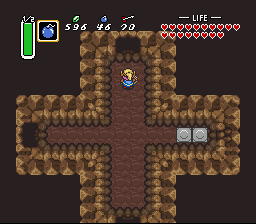 In order to find it you must lift up a rock and then navigate over an invisible bridge before bombing several walls to reveal their locations. Description: Before proceeding through the door which requires the Big Key, walk to the right or left of the door and hop off the platform into one of the jars. You will fall down to the next level and find two Small Fairies floating about. 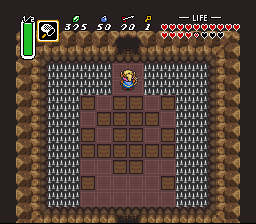 Gather them up before stepping on the Warp Tile to exit the room. 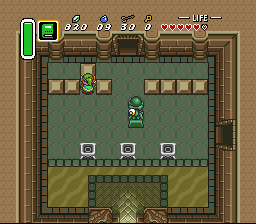 Description: Before leaving the west exit of the Desert Palace, visit the Small Fairies in the room just to the north of the room with the Sentry Statue. Push a block in the row of blocks on the left side of the room and the shutter door will open. Description: On the fifth floor of the Tower of Hera there are some openings in the floor. If you drop through on of these opening, you will fall all the way to the lowest floor of the Tower. There you will encounter heart-restoring Small Fairies. This is a great place to catch a Small Fairy and put it into a Bottle for later use. Description: In the same room where you find the Map, there are cracked walls on the left and right. 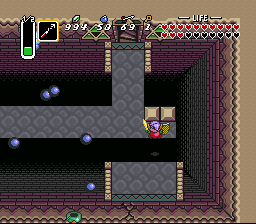 Place a Bomb in front of the crack on the right wall. Proceed through the hole to find a room full of Small Fairies. 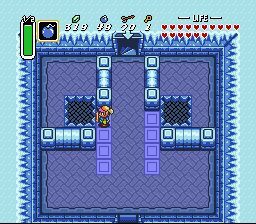 Description: When you have found the Crystal Switch in Ice Island, and have lowered the blue Crystal Switch fences, you can drop through a hole in the icy floor and then fall through a jar down into a room where Small Fairies live. Description: There is a room with spikes on the floor in Turtle Rock. Floor tiles will rise up and fly at you in this room. After 22 tiles have flown, a door at the north end of the room will open. Enter this room to find a single Small Fairy. Description: After the rematch between you and the Armos Knights, and you collect the Big Key, you return to a room with a stairwell that leads you back to the floor above. 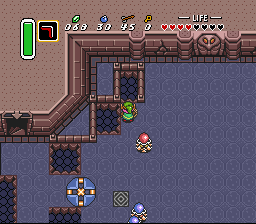 Before you take the stairs, bomb the north wall to find four Small Fairies trapped on the other side. Description: At the end of a long bridge, you'll see a cracked wall, but there is a gap which you must cross. Face away from the cracked wall and Dash into the barrier above you. The collision will bounce you across the gap. Bomb through the wall and enter the room. Faerie Queens reside in special Fairy Springs. Location: The Waterfall of Wishing. 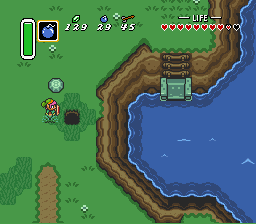 Description: After acquiring the Zora Flippers, head south along the river. 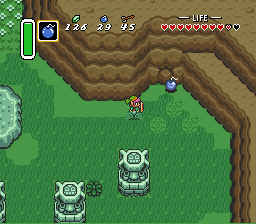 Before jumping down the waterfalls, grab the Heartpiece to the west. Then, when you reach the corner where the crab is, head northwest up to the waterfall and enter to find a Faerie Queen. You can upgrade your Boomerang and Shield here. Location: The Fountain of Happiness. 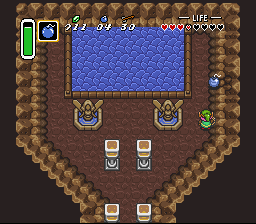 Description: After using the Waterfall of Wishing, head through the whirl pool nearby to teleport to the center of Lake Hylia. Head north onto the island and go inside to find the Fountain of Happiness. Here you may throw in Rupees in 5 or 20 increments. 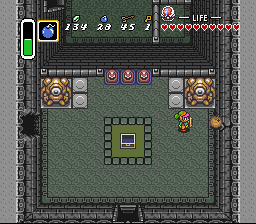 Once 100 Rupees have been thrown in, you will be prompted to upgrade your Bombs or Arrow carrying capacity. You can upgrade them to 50 and 70 respectively, for a total of 1400 Rupees. The Heavy Faerie is a Faerie Queen whose beauty was stolen by Gannon. There is only one and it resides in the Dark World. 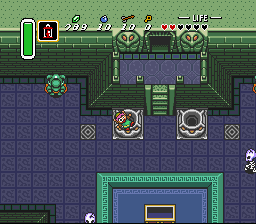 Location: Chamber of Wishing inside the base of Ganon's Pyramid of Power, Dark World, near the end of the game. Description: You will need the Super Bomb to blast open the crack in the wall halfway up the Pyramid of Power. Inside you will meet the Heavy Fairy. 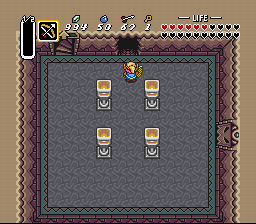 Here you can upgrade your Arrows to the Silver Arrows, required to defeat Gannon. Optionally you may upgrade your Tempered Sword (level 3) to the most powerful sword in the game, the Golden Sword. This page was last edited on 12 March 2019, at 07:14. This page has been accessed 138,319 times.